When she wakes up in the morning L likes to check the weather app on my phone to see what’s forecast for the day. I think she likes the animated visual of the rain or the shining sun but she’s also interested in the temperature. We haven’t had such a cold winter this year but there have been a few days when the temperature has dipped below zero and L is fascinated that something can be less than nothing. We decided we’d investigate further and try to make our own weather station to check if the weather forecasters on the phone get it right. 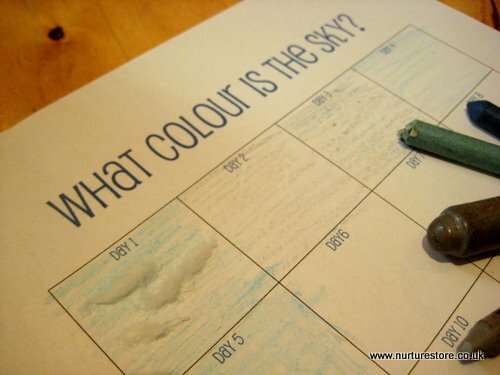 There are few different ways the children can be involved in setting this up and you can decide whether you want to looking at the sky, the wind, the temperature or the rain. A weather station project also gives you lots of scope to include many different aspects of learning: observation, recording data, graphing, guessing and estimating, taking notes and translating results in to real-life consequences. Our project is part of the Weather Blog Hop which is linking many kid blogs around the world to bring you all sorts of weather ideas you can use with your children – science, art, games, activities, you name it, we’ve got it! 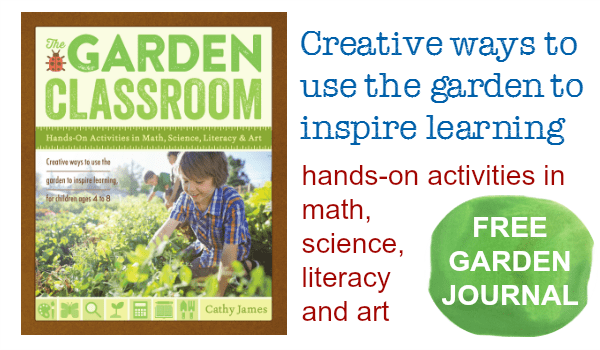 Have a browse through the links at the end of this post for lots of ideas. 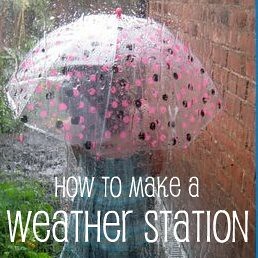 If you have a weather idea you would like to share please feel free to add it to the linky too. The purpose of our rain gauge was to set up an experiment to compare results and to be able to graph them – and the results were a big surprise for the children. When we set the rain gauge up I let the children lead and find a bottle they thought would be a good size. They were sure that on a very rainy day the bottle would be filled to overflowing! It was surprising to them to discover that a day that soaks the garden (and all the washing on the line!) 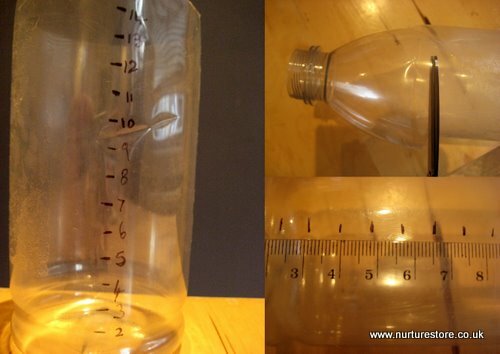 actually only gave them half a centimetre of rain in their bottle. 2. Each morning we looked at the sky to see what the weather was like that day. We tried to find exactly the right pen, pencil or crayon to colour in that day’s box on the chart so it looked just like the sky outside. (Sadly,we needed lots of grey.) We added in cotton wool clouds if there were any and looked up the names of different cloud formations. This made a patchwork picture of the weather for us. What children can learn: observation skills, that the weather changes day by day, how ‘blue’ can be all sorts of shades, that clouds can be all different shapes and sizes and have special scientific names, that observing nature can translate into art. What do changes in the weather actually mean to young children? To translate our observations into something relevant to their experiences we set up a ‘What should I wear?’ chart. 1. Create a tall chart showing different types of clothing your child might wear – you can draw them or take photos of your children’s actual clothes. 2. Sequence your clothing pictures from hot to cold. It could look something like this: sunhat, t-shirt, long sleeved top, extra vest, rain coat, winter coat, woolly hat, scarf and gloves, snow boots. 3. 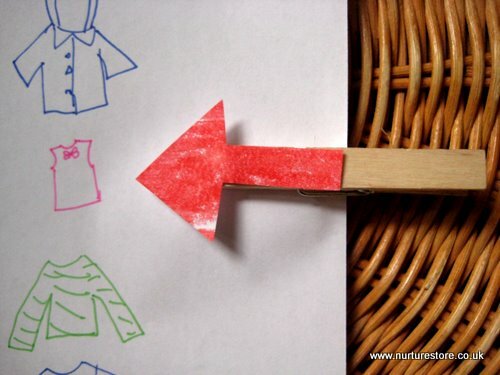 Cut out a big arrow and stick it to a clothes peg. Once you have completed your Weather Station Observation Chart for the day ask you child to think about what the weather means for what they need to wear that day. Peg your arrow marker to the right stage of your ‘What Should I wear’ chart, then go and get dressed and head out to play in the fresh air! The Weather Blog Hop is co-hosted by all these blogs: sharing your great ideas far and wide! Please add you own link and join the fun. Oh my, I LOVE this! Truly – LOVE! So much active hands-on learning and observation, recording and analyzing data. What little scientists you have there. Fabulous! I did something similar with my 2nd graders when I was teaching and it was one of our best science units. They became so aware of the weather and it was a springboard to so much more – the water cycle, clouds, seasons, etc. 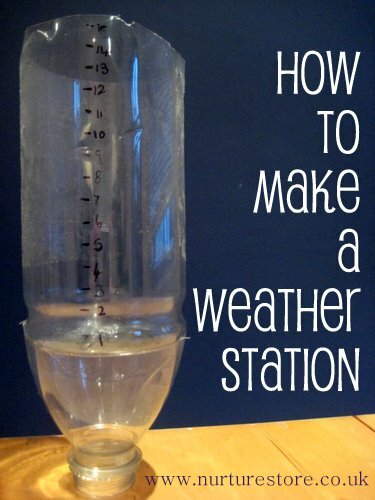 Cathy, Love the Rain gauge idea! 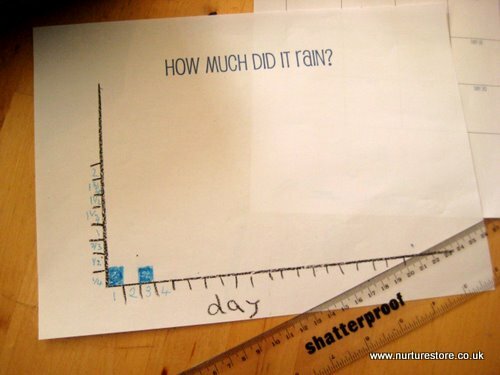 What a fun to measure, record the data! Thank you for the Weather hop initiative! We had fun with our Apple tree play! This is a great experiment! My kids would love this! This is really awesome!! I LOVE this! So much fun setting this all up, doing all the observations, recording, coloring and learning. Ahh what more do I need:)) Thank you so much for this lovely idea!! This is so cool! Now I can’t wait for rain! Oooh, I love all of the science learning going on here!